If you've read all 6 Jane Austen novels, you might think you've read all there is to read from the author, but you'd be wrong. Jane started writing when she was a wide eyed youngster and unlike juvenilia from us mortals (like my own magical cats) it's worth reading. 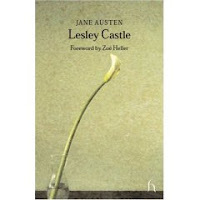 Lesley Castle is 3 unfinished works written to entertain her family when Jane was 16. Lesley Castle: In epistolary* form, the vanities and jealousies of gentrified women are told. Margaret Lesley is bored of her castle in Scotland. She writes to her friend Charlotte who worries include what to do with all the food she prepared for her sister's wedding after the groom dies. The nastiness is not as refined and subtle as her later works but the groundwork is there. The History of England: The narrator sums up the history of the monarchy in a few short pages and with as few dates as possible. The sole purpose is "to prove the innocence of the Queen of Scotland,...and to abuse Elizabeth..." It's funny and tongue in cheek. Catherine, Or The Bower: Is like many of her novels is about propriety and manners of the young and courting. Catherine could have been one of her best heroines had she completed the novel. She feisty with a dry sense of humour and definite opinions. "At some point in the course of reading these works, you are likely to feel the prickings of a baffled envy." Absolutely. Jane must have been a pistol at that age. A force of nature. Recommended for any Austen fan. If you've also reviewed this book, leave a link in the comments. I took my own photo of the book because I didn't like the fact that the images I found at bn.com and Amazon didn't show the green tint. I love green. I know, weird. Your review is much nicer -- very brief. I like that. That sounds really fun. I hadn't heard of these stories but it is just the kind of quirky fan-ish thing I think I would like to check out. I didn't know of this book, but I've added it to my TBR list! Thanks for the review. I came across your blog when I was searching for Canadian Book Blogs. I'm giving away 4 Autographed books to readers across the globe and was hoping you'd spread the word among readers of your blog. Carl- I think you'd enjoy them if you're a fan. I bought this based on Bookfool's great review but haven't read it yet. Aren't these Hesperus Press editions lovely?